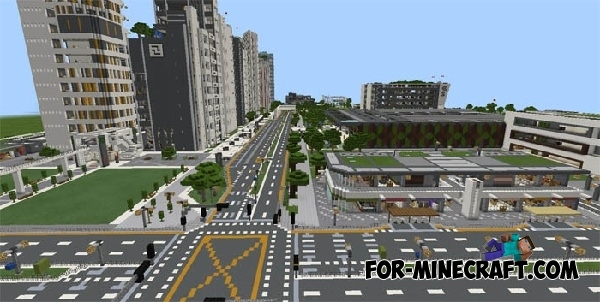 As soon as the have downloaded this map, you will see the largest and most diverse city for Minecraft Pocket Edition. The city has a modern style and all the buildings harmonize perfectly with each other. Total has been spent over 2 years for the construction of NXUS Modern map, it very much. Each building is unique, the author tried to make the city really alive. Here you will find almost all the features of a big city: the subway station, supermarkets, restaurants and cafes, a long network of roads, skyscrapers, and more. This results in a great city where each player will be delighted. The map has not been updated for a long time and this update will be meaningful for you if you have been playing Minecraft 1.2 for a long time. • Stands for the international alliance of Minecraft nations. • The official administrative centre of he IAMN. • Avrin, Peaceland and Lexerland. • One of the largest shopping centres in MCPE. • 57 unique retail and F&B stores. • A 20000+ SQM transport interchange. • Includes rail and bus links.